DNA welcomes Johnny “Spazz” Hatton to our family of endorsing artists! 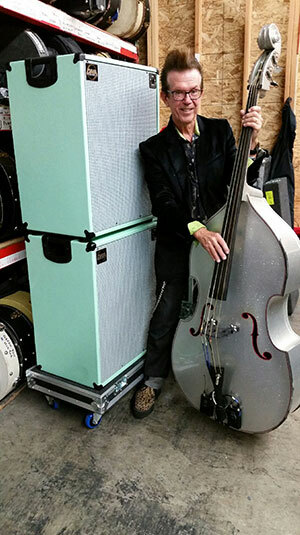 A long-time believer and user of David’s amps and cabs during the Eden years… Spazz returns to the fold on the heels of Brian Setzer Orchestra’s annual holiday tour… an amazing must see show! See links below. “David Nordschow’s ground-pounding bass amps have provided the heartbeat of the BSO for 15 years and he’s done it again! It took only 30 seconds to dial in the best Rockabilly slap bass tone I have ever heard with my new pair of DNS410 “Billy Series” speaker cabs powered by the amazing DNA-1350 head. John Vitale and I collaborated on the new “Seafoam Green” cabs with a groovy retro grill cloth to set apart these beauties from the rest of the black-on-black equipment crowd. After all, Seafoam Green says Rockabilly! John Hatton has been playing instruments since he was 6 years old. His journey with jazz string bass began with the Affton High School Stage Band in the suburbs of St. Louis. John’s musical experiences have encompassed a multitude of styles. Bluegrass, Jazz, Classical, Dixieland, Big Band, Disco, Rock, Rap and Rockabilly to name a few. He has played behind superstars including Dolly Parton, Jose Feliciano, Ray Anthony, Maynard Ferguson, John Davidson, Tony Bennet, Little Milton, Al Jarreau, Bob Dylan, Bob Hope, Supertramp, Little Richard, Etta James, Herb Jeffries, Danny Gans, Vonda Shepherd, Hank Ballard, Shirly Jones, Billy Lee Riley, Nannette Fabere’, and the list goes on. He honed his 50’s slap-bass style in Rhino Records’ “Big Daddy”, an 8-piece 50’s band, which turned modern hits into retro 50’s classics. This band conquered the world with a top 10 hit and a tour of England. Their eight-week gig in Sydney, Australia, landed them another hit with their version of “The Land Down Under”. It was in this band that Hatton created the character known as “Spazz”, the slide-rule-wielding nerd. The moniker has followed him to this day. Johnny “Spazz” Hatton has been playing rockabilly slap bass with the Brian Setzer Orchestra since February of 2002 and has recorded six Grammy-Nominated CD’s, “Nitro Burnin’ Funny Daddy”, “Boogie Woogie Christmas”, “Dig That Crazy Christmas”, “Wolfgang’s Big Night Out” and “Songs From Lonely Avenue” and Setzer’s latest CD, “Brian Setzer Goes Instru-Mental”. Hatton has appeared with BSO on The Tonight Show with Jay Leno, Conan O’Brian, The Today Show, Christmas at Rockefeller Center, Christmas in Washington DC, a state dinner at the White House for President George W. Bush, The Tony Danza Show, VH1 Classics, Sirius Radio and more. John has been touring with Royal Crown Review since 2006, visiting most of the European turf. The band and their hit, “Hey Pachuco”, was featured live in the Movie, “Mask”, with Jim Carey, and specializes in jumpin’ jazzy swing. John has been touring with Jose Feliciano since August of 2008 visiting South America, the Caribbean, Japan and Singapore in addition to the Christmas, “Feliz Navidad” tour.